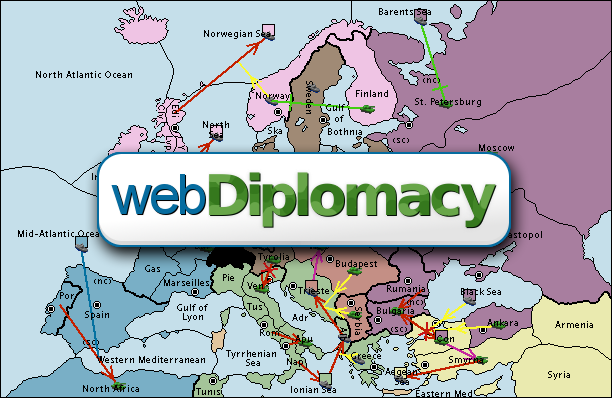 A multiplayer web implementation of the popular turn-based strategy game Diplomacy. "Luck plays no part in Diplomacy. Cunning and cleverness, honesty and perfectly-timed betrayal are the tools needed to outwit your fellow players. The most skillful negotiator will climb to victory over the backs of both enemies and friends. A quick guide to get newcomers playing the game. Diplomacy is a game which is easy to learn but impossible to master. The rules are all very intuitive, lots of people pick them up just by playing, but this document will familiarize you more quickly. webDiplomacy, as a community, is a competitive and fun place to play. Currently we have two site supported ranking systems. The first is our “Reliability Rating” (RR); this ranking is determined based on how often you fail to enter moves in a turn (NMR/No Moves Received) or leave a game before it’s conclusion (CD/Civil Disorder). Most tournaments, special rules games, or high stakes games have RR restrictions; meaning if you leave games often or irresponsibly forget to enter moves frequently you may find it hard to join competitive games. The second system is our point system ( ), which is used to determine how many games you can join and what stakes the game will be. You start with 100 and are reimbursed whenever a loss of points results in you having less than 100 . Points are fun and provide a tangible reward for winning but are far less important to your ability to play fun and enthralling games on webDiplomacy. Many of our tournaments are unranked, and those that aren’t are usually willing to play at lower levels for players with very high Reliability Ratings. The objective of Diplomacy is to be the first to get 18 supply centers. For each supply center you occupy you get a new unit, and you lose a unit whenever a supply center you own gets occupied by someone else. You can recognize the supply centers with the markers which are placed on them. This unit can only move on land. This unit can only move in the sea, and in coastal territories. 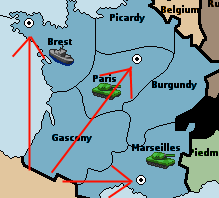 It can also convoy armies across sea territories using the convoy move. The unit will defend if its territory is attacked, but otherwise do nothing. The unit tries to move into(/attack) an adjacent territory. Support is what Diplomacy is all about. As no one unit is stronger than another you need to combine the strength of multiple units to attack other territories. You can use fleets to carry army units across sea territories, this is called a convoy. You can also string multiple convoys together to move an army unit large distances overseas in a single turn. In diplomacy no army or fleet is stronger than another, and a holding unit will always beat a moving unit of equal support. The only way to win a battle is by supporting a moving unit with another unit, using a yellow support move order. And support can be given to holding units, with a green support hold order. If the number of support moves are greater than the number of support holds the move will succeed, otherwise it will fail. Also; if a unit is being attacked it has to defend itself by holding, and can't support another unit. With these rules you know everything you need to start playing Diplomacy online! After you register a user account you can create a game and join existing games.